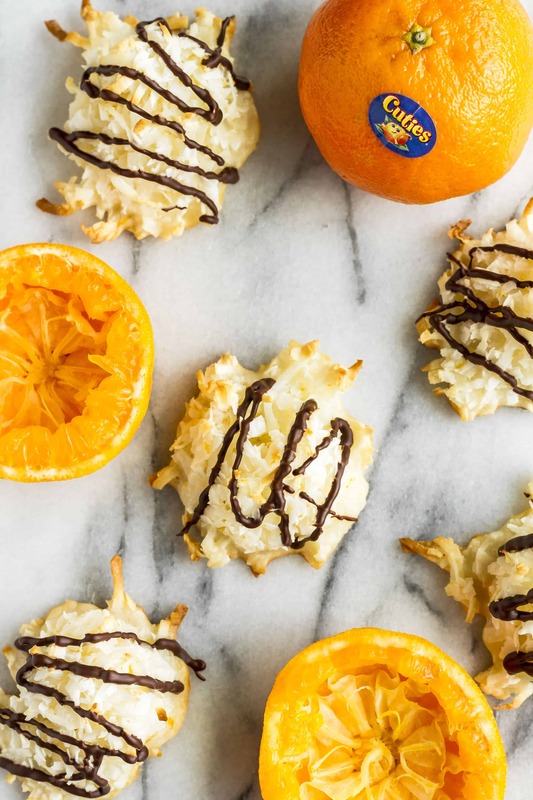 Not to be confused with macarons, this clementine coconut macaroons recipe infuses sweetened shredded coconut with the bright citrus flavor of in season Cuties clementines… Add a drizzle of semi-sweet chocolate to garnish these toasty & chewy coconut treats! This recipe was created in partnership with Cuties, growers of sweet and juicy, easy-to-peel clementines. Thanks for supporting us and the brands we love! ‘Tis the sweetest time of the year… Cookies, cakes, and candies seem to be everywhere you look, with baking treats being on everyone’s minds. The sweets baking tradition is strong in our family, too, with pizzelles, chocolate crinkles, and buckeyes topping our “must-make” list. We look forward to baking cookies together every holiday season, but those aren’t actually the sweets I’m referring to… It’s also Cuties season! That’s right, my favorite Cuties clementines are back in stores, ripe and ready to eat. I mean, what’s not to love?! 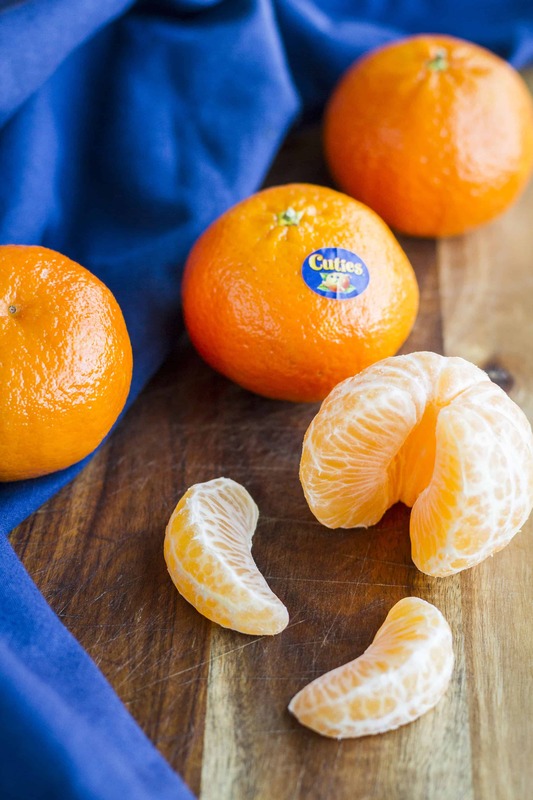 Sweet, seedless and perfectly portioned, Cuties are the ideal anytime snack. Watching for the first appearance of fresh and ripe Cuties in grocery stores is a family tradition in and of itself. This year I thought it would be fun to infuse the two traditions into one with a cookie recipe that perfectly highlights the sweet citrus flavor of Cuties clementines. These clementine coconut macaroons are right on the mark! And a drizzle of semi-sweet chocolate is the perfect accompaniment. But before I give you some tips for making them, I need to get something off my chest… Folks, macaroons and macarons are NOT one and the same! Their names are not interchangeable, though you’d think so based on the sheer number of macaron Pins that surfaced when I searched for “macaroons” on Pinterest. Just to be clear, the primary ingredient in macarOOns is shredded coconut. MacarOns, however, are delicate, little, light and airy European sandwich cookies that have a meringue base. I feel like I need to whisper this because macarons have enjoyed a huge surge in popularity lately, but I don’t love macarons. Maybe I’ve just not encountered the really, really good macarons that everyone raves about, yet, but IMO they’re just meh. But macaroons? They are most definitely my jam. And when they’re infused with Cuties clementines juice and zest? They get all of the heart-eyes emojis and more! 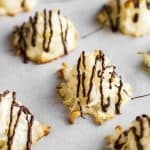 Macaroons are literally one of the easiest ever cookies to make. My recipe has just five ingredients (plus two more if you want the chocolate drizzle). As simple as they are, having made multiple batches to perfect them, I definitely have some wisdom to share to help them turn out their best! 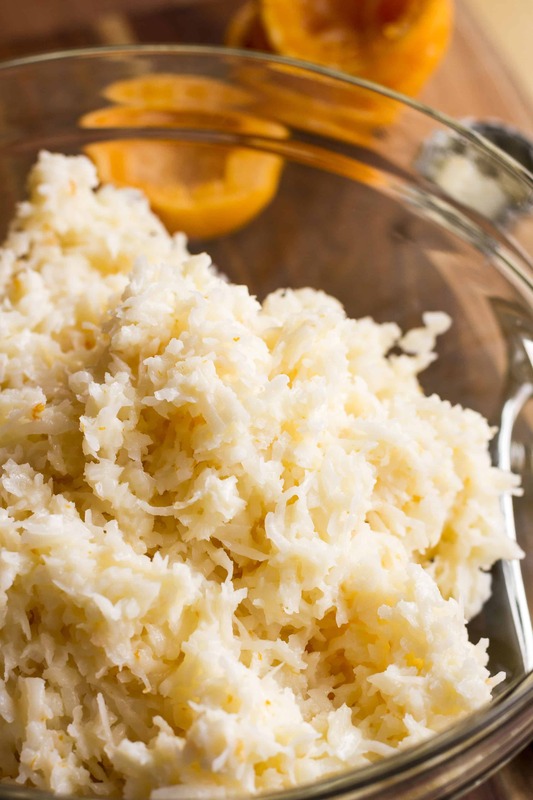 1| Make sure you pick up sweetened coconut flakes and NOT sweetened shredded coconut. Sweetened coconut flakes have more moisture, which helps the cookie hold its shape better. I made the mistake of purchasing the shredded coconut for a batch, and the cookies spread far too much. 2| Two Cuties clementines should yield enough zest and juice for one batch of these clementine coconut macaroons. Enjoy the rest of the bag or box as a snack! Or you could always make more macaroons to share with friends and family… A platter with whole, fresh Cuties interspersed would be an amazing hostess gift! 3| The recipe calls for egg whites whipped to medium-firm peaks. In case you’re not familiar with this term, it means that when you lift the beaters straight up from the egg whites, the peak that’s formed is not perfectly stiff. It should curl over just slightly at the tip. 4| Portioning out each cookie is made easy with a small cookie scoop. Really pack the macaroon mixture in the scoop, and then hold it horizontally, flat against a parchment-lined baking sheet when releasing to create a mounded cookie. 5| Drizzling these clementine chocolate macaroons with semi-sweet chocolate isn’t a requirement, but it’s truly a delicious addition. No fancy tools necessary! Just set a bowl over a saucepan of water to create a DIY double boiler. Melt the chocolate in the top bowl (being very careful not to get any steam or condensation in it), and then transfer the melted chocolate to a ziploc-style bag. Snip a tiny piece of the corner off, and drizzle away! 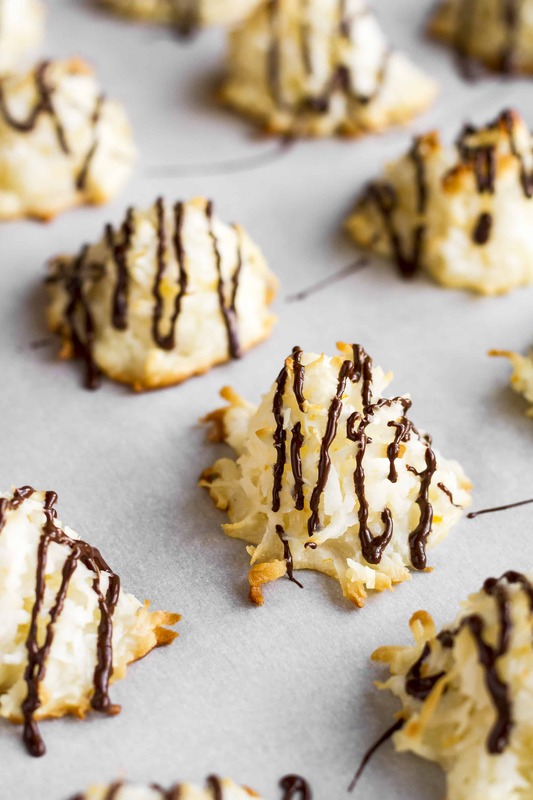 Make These Coconut Macaroons Now! I was blessed with a fair amount of willpower, but y’all, I lose all self control around these treats. They’re seriously THAT good. I can’t wait to hear your thoughts! In a large bowl, whisk together the sweetened condensed milk, clementines juice and zest, and almond extract. Fold in the sweetened coconut flakes. In a medium bowl, whip the egg white and kosher salt on high speed with a hand mixer until they make medium-firm peaks. Fold the whipped egg whites into the coconut mixture. Using a small cookie scoop, drop the macaroon batter on the parchment-lined baking sheets. On a half sheet pan, I was able to fit 15 cookies comfortably, in a 3 rows across by 5 rows down pattern. Bake for 25 minutes, until golden brown. Allow the cookies to cool on the baking sheets for 5 minutes, then transfer them to a cooling rack. Melt the chocolate and coconut oil in a double boiler, stirring until smooth. Allow the chocolate to cool slightly, then transfer it to a small ziploc-style sandwich bag. Close the bag tightly, then snip a very small piece off the corner. 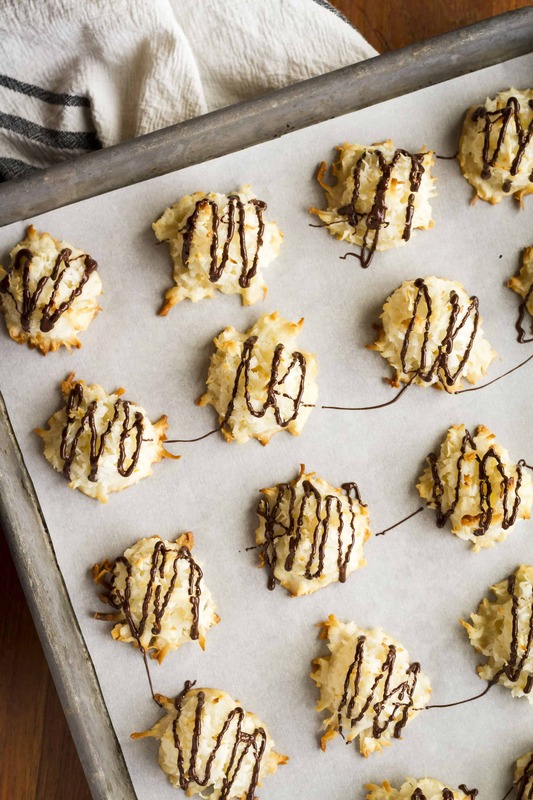 Drizzle the chocolate in a random pattern over top of the clementine coconut macaroons. Allow to cool until set before serving. Placing the cookies in the refrigerator will help the chocolate set up more quickly. See notes within the corresponding blog post for tips on making these macaroons. To celebrate the return of this delicious little citrus fruit, Cuties is bringing fans 100 days filled with love and sunshine straight from their California groves! Brighten someone’s day and share the sweetness of the season with these yummy clementine coconut macaroons during the #100DaysofSunshine. Follow along on Facebook and Instagram for more citrus-filled ideas! I’d love to see how your clementine coconut macaroons turn out… Follow and tag @CutiesCitrus and @Unsophisticook on Instagram and/or use the hashtags #100DaysofSunshine and #Unsophisticook so I can check it out. Enjoy! How long would you say these stay fresh? I’m prepping for a holiday party this week and am creating my plan now! Thanks!! Hi Lindsay! They should keep for about a week in an airtight storage container at room temperature. If you’re going to drizzle them with chocolate, be sure to separate the layers with some parchment paper.